Most people who get scorpions after living in the same home for years wonder how scorpions spread. Here are four ways we’ve watched scorpions spread in the Greater Phoenix Valley. Scorpions spread during nightly activities as they search for a mate & prey. 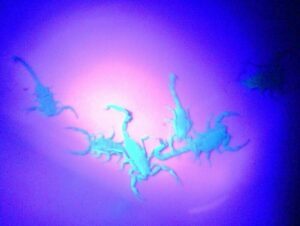 During the spring & summer scorpions ROAM at night in search of a MATE. Scorpions SPREAD during nightly HUNTS entering yards and homes looking for food & shelter. Scorpions often enter homes as shelter when the sun comes up. We have noticed scorpions getting established in new areas due to development. If you have a new neighborhood or other building under construction near by, chances are you’re going to see more scorpion activity. People moving from highly scorpion populated areas unknowingly bring scorpion stowaways to new areas in their boxes etc. Ever opened a moving box and to find a scorpion? It’s a common occurrence! Scorpions enter boxes for shelter when the sun comes up. (Better than hiding in your pants!) Weather they’re stored in your garage or just used for moving items, scorpions spread from one place to another in boxes. This is more common than you may think! Scorpions can also be transported in via landscaping materials. Nurseries DO have scorpions, and when you buy a new plant, or something for the yard, you may be getting more than you paid for. On several occasions we have seen rocks brought in and dumped in a pile, just waiting to be spread in someones new yard with SCORPIONS (and other pests) crawling around in it. Just be aware. Responsible Pest Control delivers the BEST Phoenix scorpion exterminating services with EFFECTIVE treatment of SCORPIONS, their food sources, contributing conditions, and harboring areas! Providing Scorpion Pest Control in Phoenix, Mesa, Chandler, Scottsdale, Gilbert, Queen Creek, Maricopa AZ, and surrounding areas.